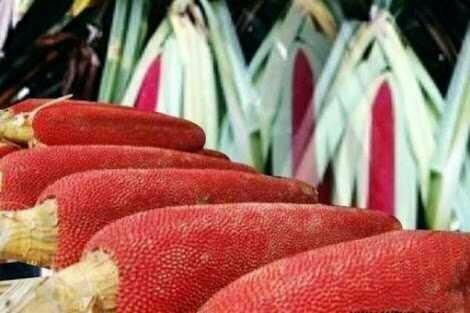 Red Fruit is a kind of traditional fruit from Papua. By the people of Wamena, Papua, this fruit is called kuansu. Its scientific name is Pandanus Conoideus because the Red Fruit plants include pandanus-pandanus family plants with pandanus-like trees, but the height of the plant can reach 16 meters with its own free branch height 5-8 m height which is reinforced by the root roots of the lower stem. Fruit cultivars are oval with buds covered with fruit leaves. Red fruit itself fruit length reaches 55 cm, diameter 10-15 cm, and weight 2-3 kg. The color when ripe is bright red maroon, although there are actually this type of plant that bear fruit brown and yellowish brown. If you have high blood pressure, then you are advised to consume red juice. This red juice can lower high blood pressure by facilitating the flow of blood and prevent the accumulation of spots in arterial blood flow. Uric acid disease is caused by liver that produces excess uric acid. Finally, uric acid is covered in kidney stones and carried to the tips of fingers and accomplices. This usually causes pain, aches, pains, tingling, even to swell in the joints. 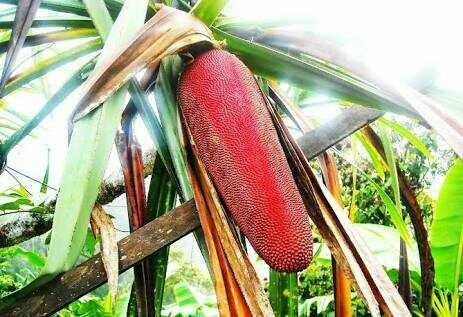 The fruit, dubbed Kuansa by the Wamena community, can cure gout by diluting blood and restoring the liver system to normal. Recent research proves that about 55,000 mg of calcium is contained in red juice per 100 grams. Therefore, red juice has abundant calcium and can provide the nutrients needed by the bone. In addition, red juice also helps avoid osteoporosis. Red fruit may also be able to treat cancer, because the content of tocopherol is very high (11,000 ppm) and beta-carotene (7000 ppm). Both of these compounds will act as antioxidants, and will boost the immune system so that including will prevent the spread of cancer cells. This type of disease is caused by the pancreas gland that can not produce enough insulin. As a result, the sugar content in the blood increases. The content of tocopherol in red fruit will help the pancreas work, so that the function of the pancreas become normal again. Based on the results of the study, red fruit extract is believed can cured high cholesterol level. In addition to noni fruit and virgin coconut oil, red fruit is believed by local people to prolong life. The benefits of the next red fruit is as anti-inflammatory. Therefore, red fruit oil is called to reduce inflammation in the body.